For all the A-Maze-ing Dessert lovers out there who really enjoy mandalas or stitching with those wonderful Dinky-Dye silk threads, here is a new design that will surely steal your heart away. 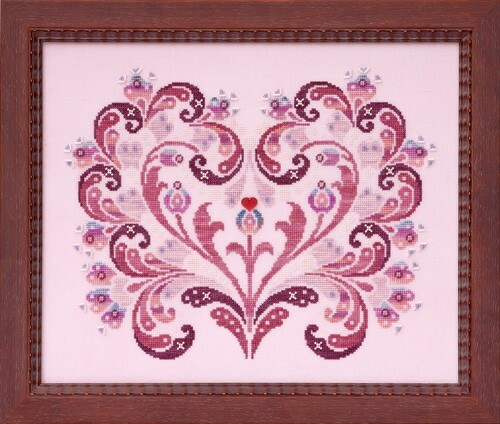 A Baroque-style heart with flowers. Definitely stunning and one you will want to display year-round. Fabric: Stitched on 28ct “Bashful” Cashel Linen hand-dyed by Picture This Plus. Materials Summary: Uses 6 colors of Dinky Dyes hand-dyed silk floss, 4 colors of Mill Hill Beads, and 1 color of Sullivans USA/Anchor/or DMC floss for attaching beads. Comparable Sullivans/DMC/or Anchor colors are not provided for this design. *NOTE: The original model was stitched with only 1 skein of 72-Cabernet. However, there was very little floss leftover. Depending upon the tension of your stitching and how much waste you produce while stitching, it is most likely that you may require a 2nd skein. The floss pack is sold with 2 skeins of 72-Cabernet to insure you have enough to complete the design.